Today, the debate over gun control gets its first congressional hearing since President Obama proposed sweeping reforms to help tackle escalating gun violence in the United States. 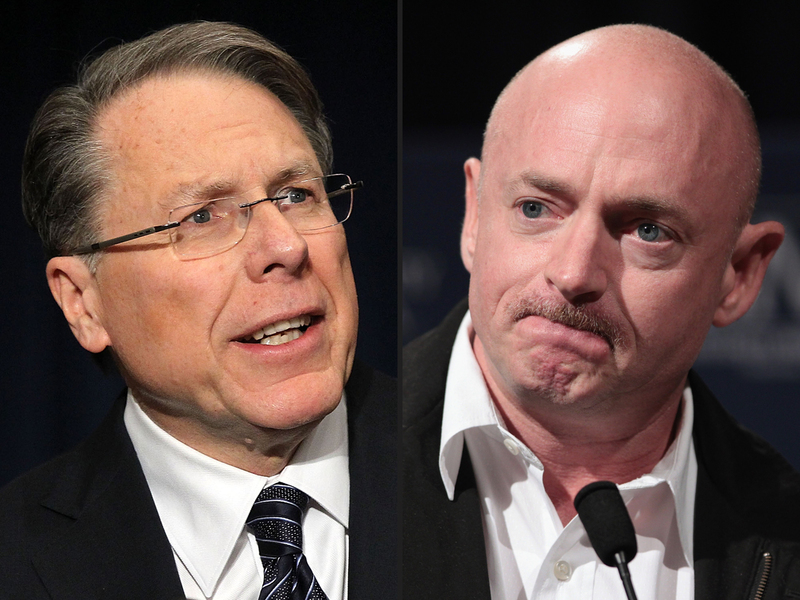 National Rifle Association CEO Wayne LaPierre and Mark Kelly, the husband of former Rep. Gabrielle Giffords, D-Ariz., who survived a shot to the head two years ago during an assassination attempt that left six people dead, are among those slated to testify in front of the Senate Judiciary Committee. One congressional source tells CBS News that Giffords herself is expected to attend the hearing; she is expected to accompany her husband and address the committee, although she's not expected to take questions. Judiciary Committee chairman Sen. Patrick Leahy, D-Vt., "wants to move legislation, and he wants to do it quickly," his spokeswoman Jessica Brady told CBSNews.com. Today's hearing will offer a platform for a "respectful and productive conversation" about "where there is potential for success in passing legislation this year." Momentum for stricter gun laws has been building since a gunman last month used an AR-15 semi-automatic "assault" rifle and multiple high-ammunition caps to kill 20 children and six adults at a Newtown, Conn., elementary school. But in prepared testimony released Tuesday by the NRA, LaPierre made the case that efforts should be focused strengthening school security and mental health resources, and predicted Mr. Obama's proposals to introduce a universal background check and reinstate the assault weapons ban "will fail." Feinstein: Assault weapons ban "an uphill climb"
"Law-abiding gun owners will not accept blame for the acts of violent or deranged criminals, nor do we believe the government should dictate what we can lawfully own and use to protect our families," LaPierre will say. "We need to be honest about what works and what does not work. Proposals that would only serve to burden the law-abiding have failed in the past and will fail in the future." The committee's top Republican, Sen. Chuck Grassley, R-Iowa, too, will be looking at what witnesses "say about other issues besides guns," his spokeswoman Beth Levine told CBSNews.com. "Mental health issues, video games, those types of things - what they have to say about how they fit into the equation." Meantime, Brady, Leahy's spokeswoman, said Leahy is "looking forward" to seeing what LaPierre's testimony yields. "We're talking about the person who is the head of the most powerful gun lobby," Brady said. "They're going to have something to say about it, and they wield a lot of influence, as people have pointed out. To have him come and see what he says - we think that's valuable." The NRA sent an "urgent" email to its members Tuesday, calling on them to attend the hearing, the Los Angeles Times reports. "You can bet the anti-gunners will be trying to mobilize their supporters to pack the hearing room," the email read, "so we need to make sure the room is filled with supporters of the Second Amendment!" Kelly also sent an email Tuesday, to members of Americans for Responsible Solutions, the independent group he founded with Giffords to push for tighter gun laws. He said he will use his testimony today to advocate for universal background checks and a ban on high-capacity magazines, and asked supporters to sign an online petition urging Congress to take up the measures. Other witnesses at the hearing will be James Johnson, chief of police for Baltimore County, Md., and chairman of the National Law Enforcement Partnership to Prevent Gun Violence; Nicholas Johnson, a law professor at Fordham University School of Law, and Gayle Trotter, an attorney and senior fellow of the Independent Women's Forum. Brady said Leahy "very much wanted to make sure we had a law enforcement representative on the panel," and pointed out that Johnson headed the partnership against gun violence even before Newtown. Levine said the GOP, meanwhile, "called constitutional scholars as their witnesses," and thus will approach revelations from the hearing "from a constitutional standpoint." Worried that the witnesses "are skewed to the anti-gun, anti-assault weapons position," though, Sen. Dianne Feinstein, D-Calif., a member of the committee who last week introduced the 2013 Assault Weapons Ban, told Politico on Tuesday she will be holding her own, separate hearing at a later date. She said Leahy "agreed that I would be able to do my own hearing on the assault weapons legislation, which I will proceed to do." Feinstein's bill, which contains much of the same language as Mr. Obama's proposals, faces long odds, particularly in the Republican-controlled House. But Rep. Paul Ryan, R-Wis., in an interview with the Milwaukee Journal Sentinel published Tuesday, suggested at least some Republicans may be amenable to changes in the current gun laws. While remaining steadfastly opposed to an assault weapons ban, Ryan argued it would be "very reasonable" to address the loophole that allows people to buy weapons at gun shows without a background check.